Contract Accountant handles the client’s financial transactions, a contract accountant prepares, analyses, drafts and verifies the financial document of the client and drafts the budget accordingly. The other important responsibilities that are included in the contract Accountant Resume sample are to document the budget reports, advice on financial conditions, recommend solutions, survey the accounting process and maintains a daily record of each and every contract of the company. Individuals seeking to acquire a contract Accountant job must be highly knowledgeable and possess solid oral and verbal communicative skills apart from satisfying the needed educational qualification. 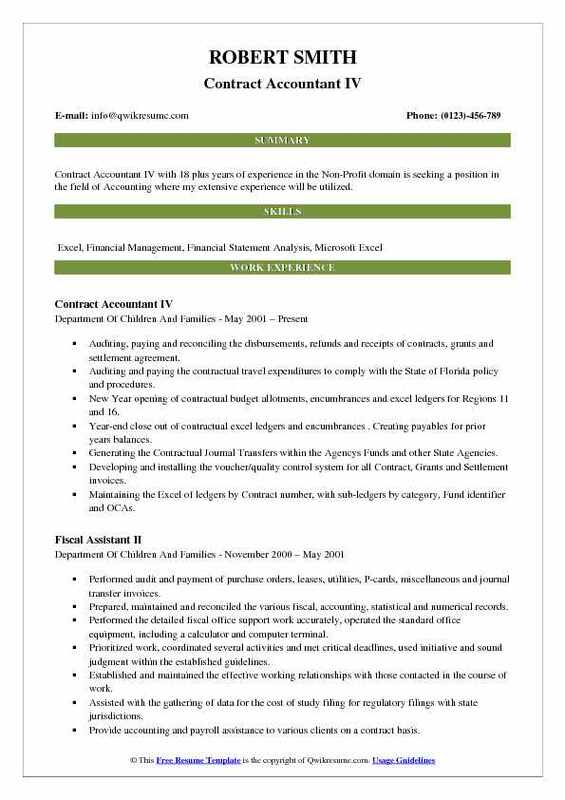 Even though formal education is not required for this job position, hiring employers prefer to pick the best Contract Accountant Resume that depicts a high school diploma with specialization in marketing or finance or accounting. 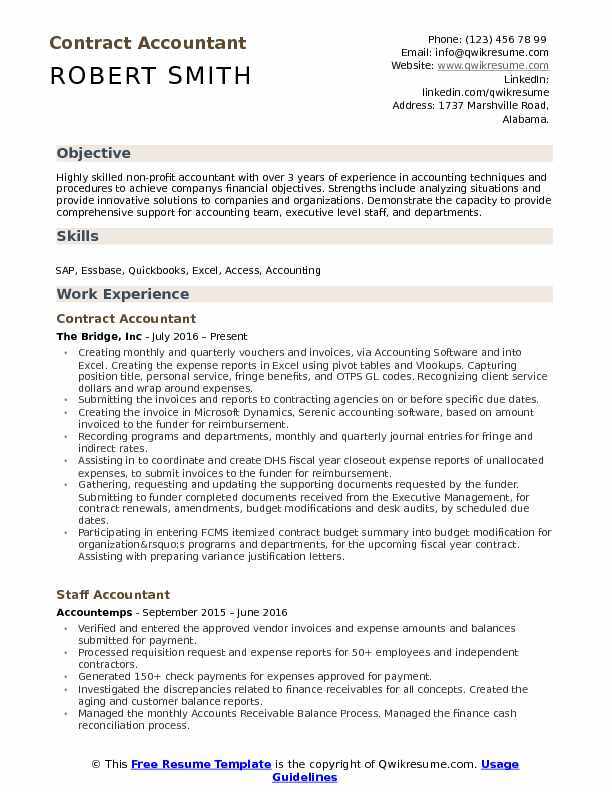 Objective : Highly skilled non-profit accountant with over 3 years of experience in accounting techniques and procedures to achieve companys financial objectives. Strengths include analyzing situations and provide innovative solutions to companies and organizations. Demonstrate the capacity to provide comprehensive support for accounting team, executive level staff, and departments. Creating monthly and quarterly vouchers and invoices, via Accounting Software and into Excel. Creating the expense reports in Excel using pivot tables and Vlookups. Capturing position title, personal service, fringe benefits, and OTPS GL codes. Recognizing client service dollars and wrap around expenses. Submitting the invoices and reports to contracting agencies on or before specific due dates. Creating the invoice in Microsoft Dynamics, Serenic accounting software, based on amount invoiced to the funder for reimbursement. Recording programs and departments, monthly and quarterly journal entries for fringe and indirect rates. Assisting in to coordinate and create DHS fiscal year closeout expense reports of unallocated expenses, to submit invoices to the funder for reimbursement. Gathering, requesting and updating the supporting documents requested by the funder. Submitting to funder completed documents received from the Executive Management, for contract renewals, amendments, budget modifications and desk audits, by scheduled due dates. Participating in entering FCMS itemized contract budget summary into budget modification for organization’s programs and departments, for the upcoming fiscal year contract. Assisting with preparing variance justification letters. Supporting in the revamping of and maintaining the organization's contract schedule summary with contract term periods, award amounts, programs and departments, amendments and budget modifications, payment methods, funder contacts and other contracts pertinent information. 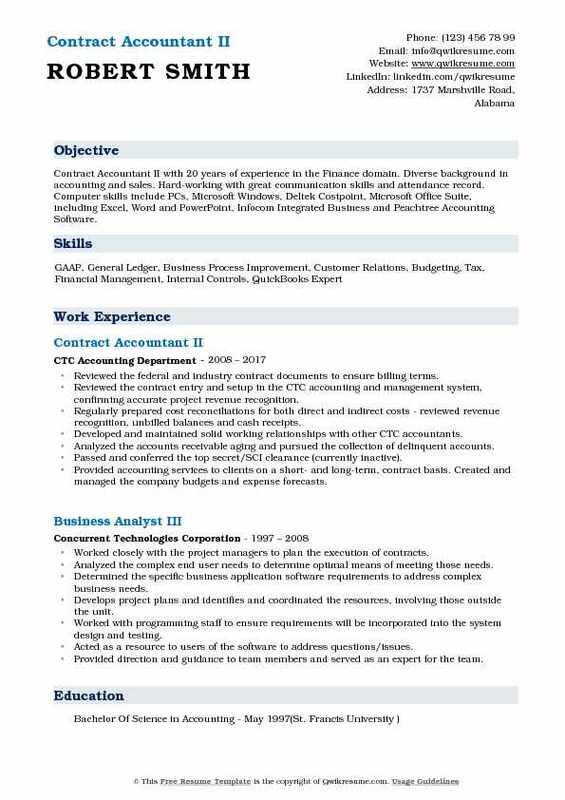 Summary : Contract Accountant with 30 years of experience, worked in many types of organizations and can work with people at all levels. Good general ledger experience. Extensive A/P & A/R experience Have experience with different systems. Scanning and coding the vendor invoices and sent them out for approval. Maintaining an asset account by making required journal entries and reconciling to the G/L balance. 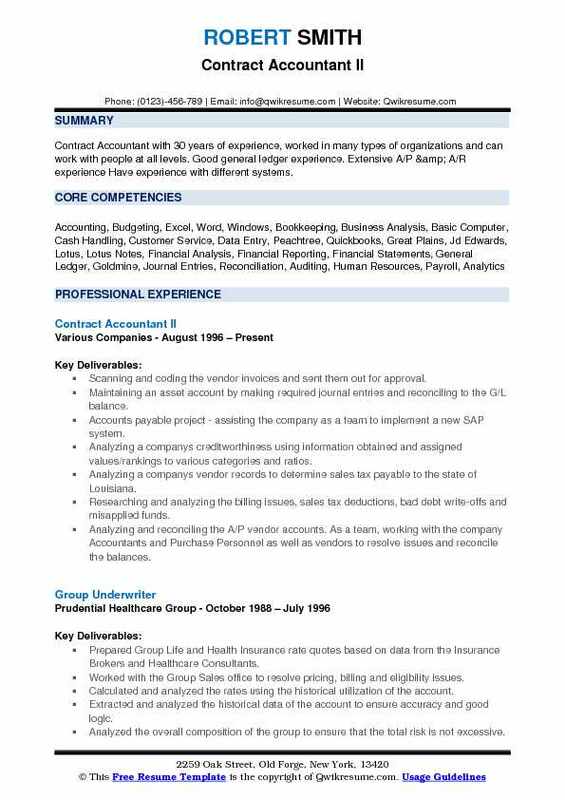 Accounts payable project - assisting the company as a team to implement a new SAP system. Analyzing a company's creditworthiness using information obtained and assigned values/rankings to various categories and ratios. Analyzing a company's vendor records to determine sales tax payable to the state of Louisiana. Researching and analyzing the billing issues, sales tax deductions, bad debt write-offs and misapplied funds. Analyzing and reconciling the A/P vendor accounts. As a team, working with the company Accountants and Purchase Personnel as well as vendors to resolve issues and reconcile the balances. Working in a team of Accountants assigned to the Accounts Receivable Department. Working with Collectors in the Credit Department as well as the customers to reconcile accounts and settle outstanding balances. Preparing the monthly joint venture reports using MS Excel and MS Access. Reports were prepared from various company documents as well as the vendor reports. 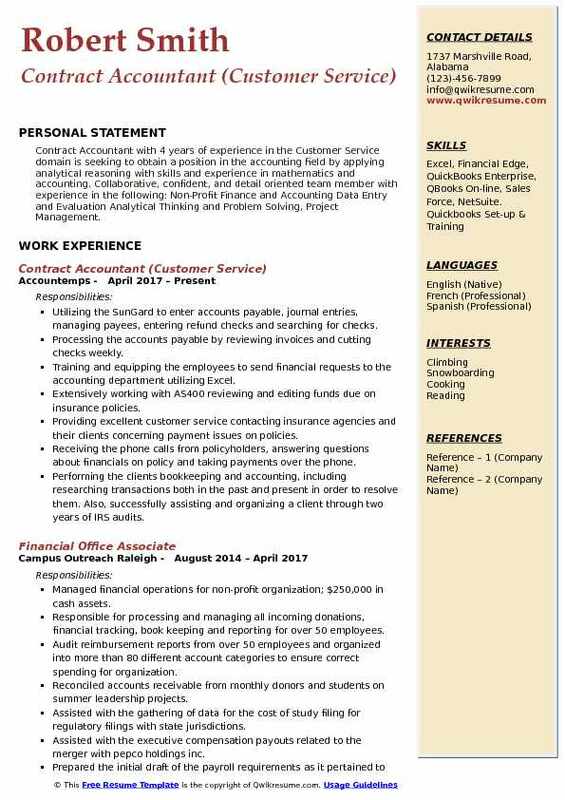 Summary : Contract Accountant IV with 18 plus years of experience in the Non-Profit domain is seeking a position in the field of Accounting where my extensive experience will be utilized. Auditing, paying and reconciling the disbursements, refunds and receipts of contracts, grants and settlement agreement. Auditing and paying the contractual travel expenditures to comply with the State of Florida policy and procedures. New Year opening of contractual budget allotments, encumbrances and excel ledgers for Regions 11 and 16. Year-end close out of contractual excel ledgers and encumbrances . Creating payables for prior years balances. Generating the Contractual Journal Transfers within the Agency's Funds and other State Agencies. Developing and installing the voucher/quality control system for all Contract, Grants and Settlement invoices. Maintaining the Excel of ledgers by Contract number, with sub-ledgers by category, Fund identifier and OCAs. Preparing various reports from SAP for the Cost Accountant and Controller. Performing the year-end closing activities and special projects, including the master chart of accounts documentation. Reviewing monthly financial statements for approximately 100 worldwide units for accuracy, proper account classification, accruals, etc. Writing procedure for uploading monthly bank statements from global affiliates into NetSuite and trained other users on the upload process. Preparing the financials for 5500 tax returns and working with the Auditors to finalize. Summary : Contract Accountant with 18 years of experience in the Telecommunications domain is seeking to provide contract accounting services in a business which offers opportunities for managing a company's financial reporting and accounting; the challenges of working with the companys owners to maximize the companys income, equity and potential; and provide opportunities for professional and personal growth. Responsible for converting all of our existing lease systems to conform to sprints accounting methods and lives. Preparing the lease disclosures for the GAAP and IFRS reporting. Reviewing the debt and cash transactions and reconciliations. Developing a methodology to correctly calculate the straight-line impact of amendments and modifications to our lease to conform to the GAAP requirements. Performing monthly and quarterly accounting schedules for reporting. Responsible for review and analysis of all SAS revenue contracts when contract volume increased three fold. Implemented the system conversion for 20,000 tower leases. Reviewing the cash, debt and investment activities. Reconciling and reviewing the spectrum licenses and leases of $1B to meet audit requirements. Converting the spectrum leases from excel spreadsheets to the database system which provides significant time savings and improved accuracy. Performing the monthly accounting for spectrum leases and related analysis. Drafting the cash flow reporting and 10Q and 10K disclosures and audit committee reports. Responsible for purchase accounting and valuation of clearwires spectrum and integration of sprints $2B of spectrum in reverse merger transaction. MDRNA Inc. (Nastech Pharmaceutical Company, Inc). - performing duties of assistant controller. Responsible for general ledger, monthly close and reporting. Drafting 10Q and 10K reports and other Sec reports as needed. Working with the audit and SOX personnel for compliance and reporting issues. Preparing the analysis and documentation for companys first department of revenue audit. Summary : A strong Contract Accountant with more than 10 years experience in an ever-changing landscape of job requirements, project deadlines and tasks as they are presented. Good multitasker and have the ability to handle any accounting crisis in a variety of areas. Accounts payable Accounts receivable Bank reconciliation Collections General ledger Training Cash management Journal entries Customer service Month-end closing Payroll Garnishments Child Support Human Resources. Processing the cash application and customer payments through Route Manager software. Reconciling the bank statements for multiple banks and multiple bank accounts. Preparing the federal and state income tax returns, prior year tax return reviews and corrections. Using lib tax software prepared individual tax returns for current and prior years. Assisting the customer with tax questions, issues, and problems and scheduling appointments. Maintaining the daily entry into multiple customer accounts that include individual accounts receivable, accounts payable, and bank accounts. Responsible for the management of contracted technical projects entry, billing and completion in dedicated project management software through direct communication with the Technical/Engineering staff. Reviewing of all sub-contractor invoices for coding to be billed to the government. Entry of billing information of all contracts received from the government. Summary : Contract Accountant II with 20 years of experience in the Finance domain. 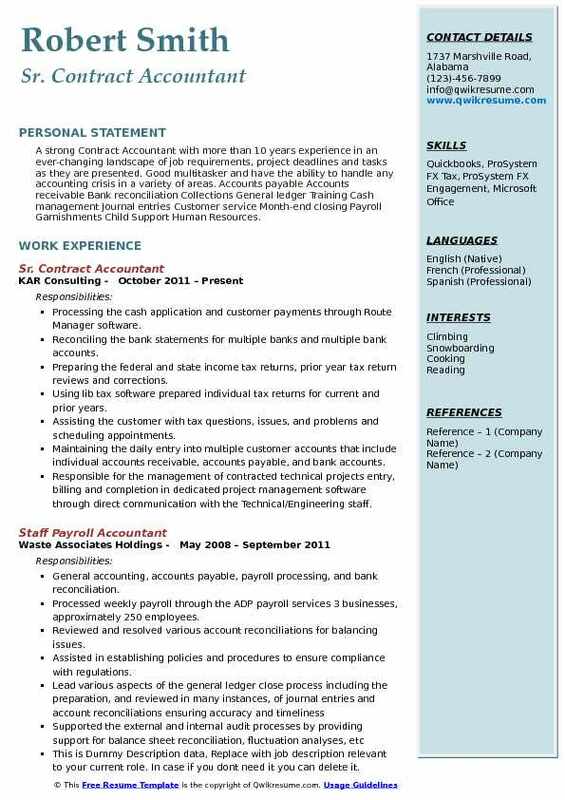 Diverse background in accounting and sales. Hard-working with great communication skills and attendance record. Computer skills include PCs, Microsoft Windows, Deltek Costpoint, Microsoft Office Suite, including Excel, Word and PowerPoint, Infocom Integrated Business and Peachtree Accounting Software. Reviewed the federal and industry contract documents to ensure billing terms. Reviewed the contract entry and setup in the CTC accounting and management system, confirming accurate project revenue recognition. Regularly prepared cost reconciliations for both direct and indirect costs - reviewed revenue recognition, unbilled balances and cash receipts. Developed and maintained solid working relationships with other CTC accountants. Analyzed the accounts receivable aging and pursued the collection of delinquent accounts. Passed and conferred the top secret/SCI clearance (currently inactive). Provided accounting services to clients on a short- and long-term, contract basis. Created and managed the company budgets and expense forecasts. Developed/revised/managed the internal accounting processes. Performed full cycle accounting tasks. Established the business accounts including foreign entity, taxes, and unemployment. Filed and payed the business, employer, and sales taxes. Set up and managed the file systems. Performed the monthly reconciliation, review, and financial reporting. Conducted monthly reconciliations, performed month-end close, maintained a chart of accounts, booked invoices and record receivables using QuickBooks online and other applications. Objective : Meticulous, project-oriented Contract Accountant with general ledger and full cycle accounting experience of 1 plus years including financial statement preparation and report generation. Thoroughly research and successfully resolve monetary discrepancies, prepare detailed reconciliations and extremely analytic. Utilize many accounting programs, perform system upgrades and conversions. Possess advanced Excel skills. Generated monthly financial statements including preparation of journal entries, resolved issues and discrepancies, reviewed the income statements and balance sheet with documentation of variance prior to Close for Chesapeake Utilities - Florida Public Utilities business units. 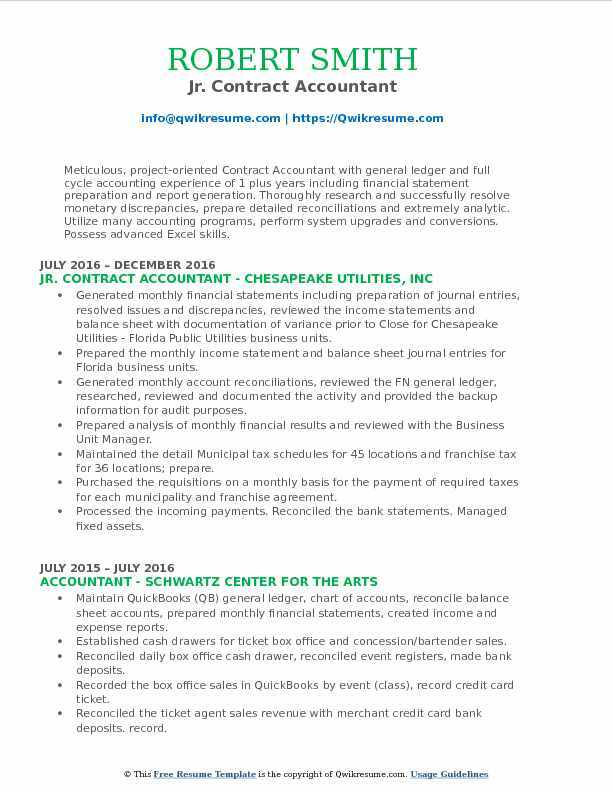 Prepared the monthly income statement and balance sheet journal entries for Florida business units. Generated monthly account reconciliations, reviewed the FN general ledger, researched, reviewed and documented the activity and provided the backup information for audit purposes. Prepared analysis of monthly financial results and reviewed with the Business Unit Manager. Maintained the detail Municipal tax schedules for 45 locations and franchise tax for 36 locations; prepare. Purchased the requisitions on a monthly basis for the payment of required taxes for each municipality and franchise agreement. Processed the incoming payments. Reconciled the bank statements. Managed fixed assets. 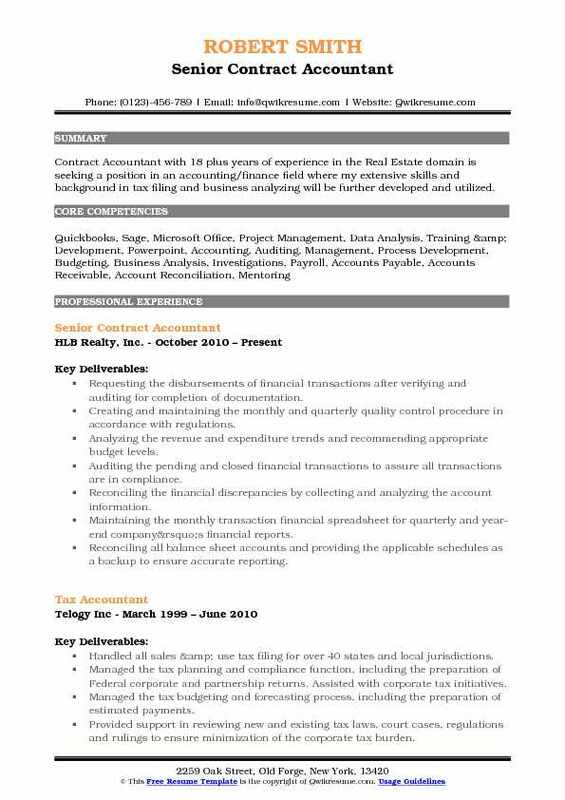 Summary : Contract Accountant with 18 plus years of experience in the Real Estate domain is seeking a position in an accounting/finance field where my extensive skills and background in tax filing and business analyzing will be further developed and utilized. Requesting the disbursements of financial transactions after verifying and auditing for completion of documentation. Creating and maintaining the monthly and quarterly quality control procedure in accordance with regulations. Analyzing the revenue and expenditure trends and recommending appropriate budget levels. Auditing the pending and closed financial transactions to assure all transactions are in compliance. Reconciling the financial discrepancies by collecting and analyzing the account information. Maintaining the monthly transaction financial spreadsheet for quarterly and year-end company’s financial reports. Reconciling all balance sheet accounts and providing the applicable schedules as a backup to ensure accurate reporting. Preparing the quarterly external financial reports. Assisting the Property Managers in Lease Administration processing. Reviewing the documentation and coding of payable invoices, check requests, and capital expenditures. Monitoring the cash balances and preparing the weekly and monthly bank statement reconciliations. Monitoring the Accounts Receivable balances and working with Property Manager on keeping them clean and accurate. 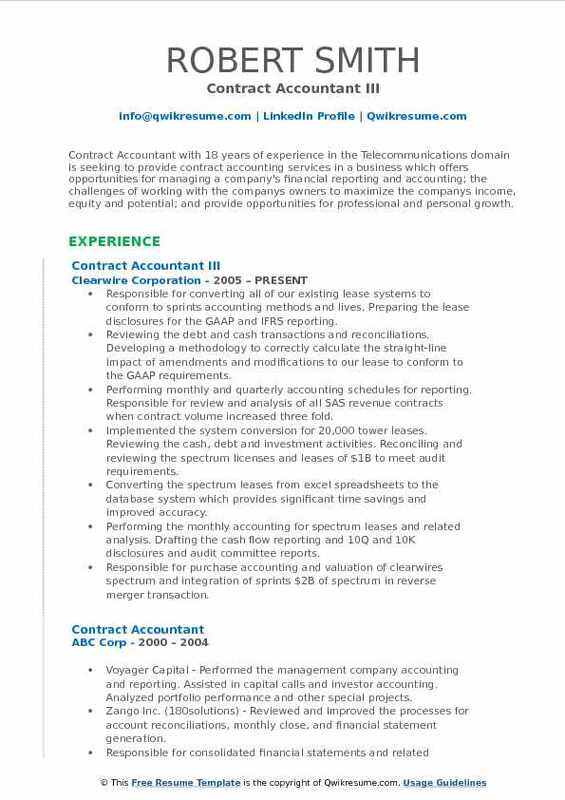 Objective : Contract Accountant with 4 years of experience in the Customer Service domain is seeking to obtain a position in the accounting field by applying analytical reasoning with skills and experience in mathematics and accounting. Collaborative, confident, and detail oriented team member with experience in the following: Non-Profit Finance and Accounting Data Entry and Evaluation Analytical Thinking and Problem Solving, Project Management. Utilizing the SunGard to enter accounts payable, journal entries, managing payees, entering refund checks and searching for checks. Processing the accounts payable by reviewing invoices and cutting checks weekly. Training and equipping the employees to send financial requests to the accounting department utilizing Excel. Extensively working with AS400 reviewing and editing funds due on insurance policies. Providing excellent customer service contacting insurance agencies and their clients concerning payment issues on policies. Receiving the phone calls from policyholders, answering questions about financials on policy and taking payments over the phone. Performing the client's bookkeeping and accounting, including researching transactions both in the past and present in order to resolve them. Also, successfully assisting and organizing a client through two years of IRS audits. Preparing general ledger journal entries for the month end. Reconciling the balance sheet and P&L accounts. 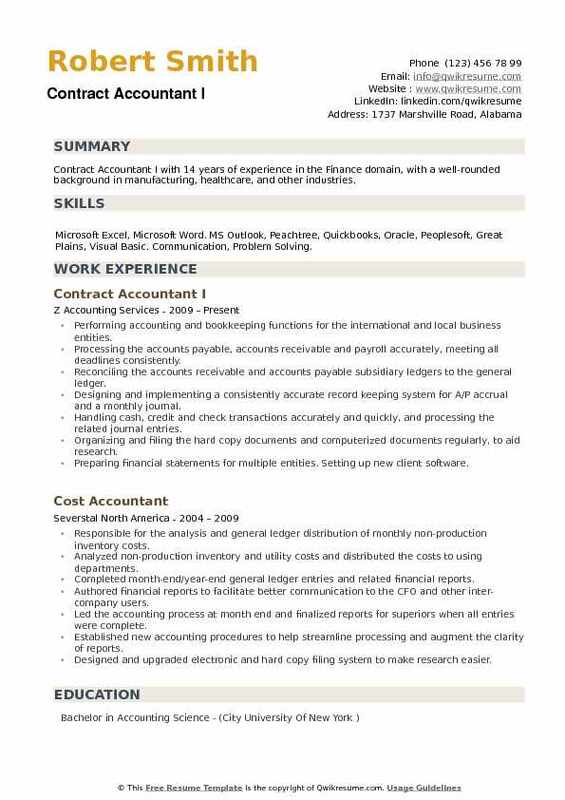 Summary : Contract Accountant I with 14 years of experience in the Finance domain, with a well-rounded background in manufacturing, healthcare, and other industries. Skills : Microsoft Excel, Microsoft Word. MS Outlook, Peachtree, Quickbooks, Oracle, Peoplesoft, Great Plains, Visual Basic. Communication, Problem Solving. Performing accounting and bookkeeping functions for the international and local business entities. Processing the accounts payable, accounts receivable and payroll accurately, meeting all deadlines consistently. Reconciling the accounts receivable and accounts payable subsidiary ledgers to the general ledger. Designing and implementing a consistently accurate record keeping system for A/P accrual and a monthly journal. Handling cash, credit and check transactions accurately and quickly, and processing the related journal entries. Organizing and filing the hard copy documents and computerized documents regularly, to aid research. Preparing financial statements for multiple entities. Setting up new client software. Preparing the government reports. Preparing some tax returns, A/P, A/R, balance sheet reconciliations, multi-state sales and use tax, franchise tax. Training and developing the employees. Ensuring the integrity of financial statements through reconciliations and audits. Implementing all accounting procedures and maintaining the integrity of financial information.